Leonardo is transversing the rooftops on his way to rendezvous with Michaelangelo. As the turtle muses about the Shredder turning up again, a shadowy form resembling his arch enemy approaches him from behind. The mutant ninja launches an attack, but it turns out to be Donatello. Leo manages to disrupt his charge at the last second as Don dodges, admonishing his brother for assaulting him. Leonardo points out to Donny that his armor looks like the Shredder’s. Donatello is surprised and states that he was thinking about Saki – so the armor must have taken that form subconsciously. The brainy turtle points out once again that he’s been having problems controlling the armor ever since the CPU vacated it. The two are interrupted by Mike, who berates them for making so much noise. Mikey then leads his brothers to an abandoned theater where he’s tracked the Foot Clan. The trio spots some Elite Guards standing watch, and proceed to take them down and borrow their outfits to infiltrate the building. Inside, Raphael is wearing the Shredder’s armor and overseeing the trianing of his raw recruits. The mutated and angry Master Splinter sits next to him in a cage. As Mike, Don and Leo approach, Splinter smells them and calls out a warning. The three brothers attack and the Foot Soldiers do what they can – but they’re no match for the mutants. Mike’s Elite Guard helmet is knocked off by one of the instructors, and when the Foot recognize who he is, they bow before him… much to his surprise! 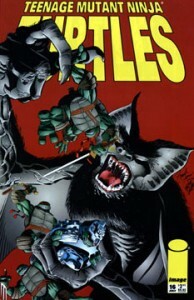 Meanwhile, Leo attacks “Shredder” – after a brief skirmish, Raph begins laughing, as he recognizes Leonardo’s voice. Raph removes his helmet and the two share a laugh together. Mike asks Raph what’s going on, and he explains how he has come to lead the remaining members of the Foot Clan and how he barely survived being bitten by Master Splinter. Fortunately he was cured by Cheng, the Foot’s master of mystical arts. Leo asks why he hasn’t cured Splinter, and Cheng explains that their Sensei’s will is too strong and he’s fighting the cure. The Foot Mystic then asks the Turtles to assist him – if they can distract the bestial Splinter in the astral plane, he will be able to cure him. Donatello is reluctant to travel back to the astral plane after his recent ordeal there, but after seeing how serious the situation is, he decides to accompany his brothers.